I’d like to tell you a story, if you would permit me the chance to. I first met Bill Pond at one of the shows we Emperor’s horde played in Cambridge, MA late last year. The use of “first met” in this instance is disingenuous as I had seen him many times before, bopping and grooving along in the crowd, usually found along the sidelines bedecked in Military regalia befitting an Admiral, and in general putting our own frippery and costumery to shame, but I digress. It was our first true conversation, which I have the dismay of not remembering clearly today. It is difficult to misplace a man in a crowd when that man looks ready to mount an elephant and take on steamships with musket and cavalry. As a person myself overly fond of the living breathing surreal performance art of wearing ridiculous clothing in public spaces, Bill and I got along immediately; I made a point of taking the time to talk with him each time I spotted his form in the crowd, and came to recognize him, his jubilantly gritty perspective of life, and his eager joy when his daughter Carli would accompany him into the fray as well. He was that certain special kind of person you hope to meet while sweating, cursing and playing onstage for a packed room of sweating, cursing, dancing people: a Super Fan. Over the next few months of local shows I saw Bill frequently, often with a frock, jacket, or strange instrument in hand, as gifts to alter for costumes or new skills to learn. When Bill stopped being present at shows, it took me a while to notice. In fact, it wasn’t until the weekend of Boston Summer Arts Weekend, directly after ENSMB performed on the mainstage for a full crowd of revelers, that I came to realize there was something wrong, and only after receiving word from Bill’s son Cameron, a compassionate and giving man I had not yet had the pleasure of meeting. What followed was juggling. Phone calls with the Melrose-Wakefield Hospital, messages with Cameron and Carli, and the wrangling of our marching band family. If Bill could no longer come out to see us, then we decided we would simply have to go and see him. Now I can hear you in the back row, “A Marching Band? In a Hospital? !” Melrose-Wakefield Hospital did an incredible job facilitating our visit with Bill and his family, something I will be eternally grateful for. In the face of death there is little we can do, except give our passions and our voices, and so we played. 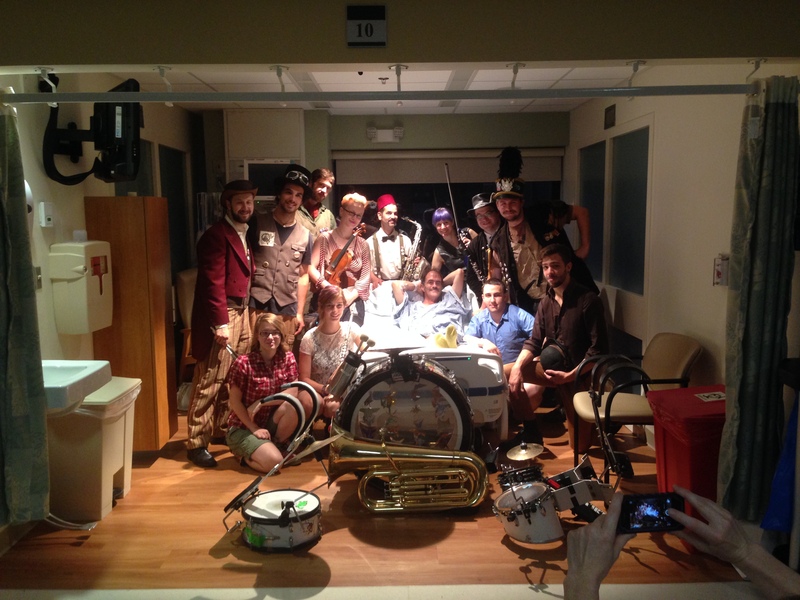 When a Marching Band, even the raucous Emperor’s, needs to be quiet to be able to take requests from a Hospital Room audience, we can. Our alto sax player Mr. Squirrel was quick to point out his feelings of the band being TOO quiet, which Bill fully agreed with, often gesturing for us to play louder. The evening was filled with laughter, music and stories. I am thankful he was able to be in his own home with his family, and I am thankful that we had the opportunity to share one more evening of music with him. Bill is survived by his son Cameron Jude Pond and daughter Carli Pond. When Bill was first admitted to the Hospital Cameron put up a GoFundMe page to help his family offset the Hospital costs for chemotherapy and painkillers needed to allow Bill comfort in his last weeks. Please take a moment to take a look at the page— where you can also see examples of Bill in his many different personas— and if possible give whatever you are able. To lose a family member and gain debt is by no means a fair trade. Thank you for your time in reading this, and Bill? Thank you. For everything. You will be truly missed. This entry was posted in Uncategorized and tagged bill pond, ENSMB, Melrose-wakefield hospital, superfan. Bookmark the permalink.